Join us as the mathematics education community continues the Collective Call to Action - From Awareness to Action: Equity & Social Justice in Mathematics Education. NCTM is hosting the first book study around The Impact of Identity in K-8 Mathematics: Rethinking Equity-Based Practices. As a part of our Collective Call to Action to address Equity and Social Justice in Mathematics Education, teachers and mathematics leaders are invited to read this book and discuss its topics of leveraging math competencies, learning identities, challenging spaces of marginality and more. A dedicated online community space is provided to participants to communicate their thoughts in hosted discussions. Discussions will be divided into four parts through mid-January culminating with a webinar, January 17, with members of the author team. Learn More about the online communities and register for the webinar. NCSM will host the second book study beginning in mid-January, Excellence Through Equity: Five Principles of Courageous Leadership to Guide Achievement for Every Student (2016) by Alan M. Blankstein and Pedro Noguera. Blanstein & Noguera (2016) talk about courage as the essential human virtue, and how courageous leadership is the “engine that drives the paradigm shift”. 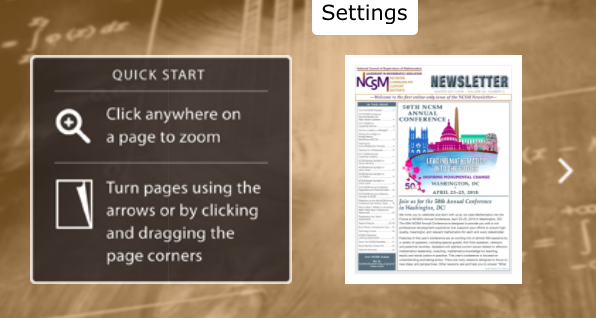 Visit NCSM’s Equity Leadership Resources to get this year’s reading schedule. Plan ahead to join us at NCSM’s Annual Conference where Pedro Noguera will be our keynote speaker. Watch for the January eNews for another exciting contest. Monday, April 23 we will be having a party to celebrate our anniversary, honor the past and look toward our future. This event is going to be different than receptions we have previously hosted. Tickets are not going to be provided to the first to register for the conference. To join us at this event we are asking for a minimum donation of $19.68 to honor the founding year of NCSM. This donation is nonrefundable and will go to the Iris Carl Foundation to help new leaders attend NCSM. The space and tickets for this event are limited. Big Ideas Learning and National Geographic are joining us as sponsors for the event. Your reservation donation will not pay for any of the reception and will go in its entirety to the foundation to help new members attend annual meetings. We will enjoy heavy hors d’oevures and drinks during our celebration. Decorations will honor our 50 years and the students we serve. We hope you will have your schools send in their mathematics art to honor the number 50. The work from students at all grade levels, states and provinces of our membership will be displayed. See the addition information about submitting your artwork in this eNews. The entertainment will include music and pictures from the decades of NCSM. We will be having short bursts of entertainment throughout the evening. We are working on a special event during the reception titled, "OVER UNDER FIFTY" and stay tuned for details, you will not want to miss the fun. Other interactive displays will also be available to enjoy. Our celebration will be hosted at the National Geographic Building a short distance from the Convention Center. Busses will be provided for transportation from the Convention Center and back to the hotels at the end of the event. Members attending this celebration will receive a special gift book which documents the history of our organization. Don’t worry if you cannot attend as our bookstore will have a limited number of the booklets on day 2 of the conference. Attendees will have the opportunity to take pictures within the National Geographic Yellow Frame to document your evening. Remember this event is limited and if you wish to attend make sure you make your reservation now. When all the tickets are all reserved we will start a wait list. There will be no wait line on site so you will be notified if space becomes available. We hope you will join at this once in a lifetime event. Engage in rich content, to include both mathematical and social justice content, explicitly designed to illustrate the transformation needed for learning environments, instructional practices, and systemic forces in mathematics education. Learn research-based strategies from experts in mathematics equity and social justice to empower mathematics education leaders with professional learning resources to bring back to their local school district. Have time for quality conversations and questions around tough topics directly with workshop presenters. NCSM is pleased to present its prestigious Kay Gilliland Equity Lecture Award for 2018 to Eden Badertscher of Education Development Center (EDC), an international education and health nonprofit based outside Boston. The annual award recognizes unique contributions to equity in mathematics education. A senior project director at EDC, Badertscher has spent her career working to close opportunity gaps in mathematics education and ensure that it promotes the proficiency of all students. She has extensive expertise in teacher education, mathematics curriculum and professional development, alignment with standards, and advancing effective mathematics instruction in urban school districts. As Principal Investigator of Designing for Equity by Thinking In and About Mathematics, Badertscher leads a team working to close opportunity gaps for marginalized mathematics students in grades 6-12 by forming strong communities of mathematical practice that engage teachers, school and district leaders, and mathematicians. The program looks at school as a system, examining its issues of institutional racism, and engaging teachers to help disrupt that status quo. Badertscher is also leading a team to develop a diagnostic tool to help identify where opportunity gaps exist. Recently her team received a Fellowship from 100Kin10 in recognition of the importance and promise of this work. Read a blog post by Badertscher about this project. Prior to EDC, Badertscher worked to advance education reform in the Pittsburgh Public Schools and Prince George County Public Schools where she helped support teachers, enhance instruction, and address district needs related to special education, culturally relevant teaching, and English language learners. 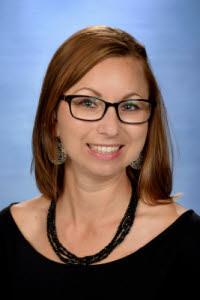 She has taught at both the undergraduate and graduate levels. She holds a BA from Princeton University and an MEd and PhD from the University of Maryland. The Kay Gilliland Equity Lecture Award was first established in 2013 to honor the vibrant and service-oriented president of NCSM who also served as a conscientious editor of NCSM's newsletter. Gilliland was tireless in her efforts to achieve equity in mathematics for all, especially for children of color, those from marginalized communities, and low-income backgrounds. 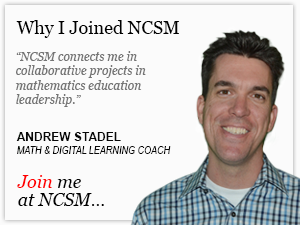 NCSM enabled her to learn and work locally, nationally, and internationally to improve the teaching and learning of mathematics. Badertscher delivers the Kay Gilliland Equity Lecture at the 50th NCSM Annual Conference in Washington DC. It will be held Tuesday, April 24, 2018 at 11:15 am. We hope to see you there.